- Stainless Steel spearfishing knife, easily attaches to your weight belt, your arm or leg with straps provided. - Quickly and humanely kill your catch with this ideal tool for the job. Prevent the panicking fish from alerting nearby sharks to the feeding opportunity, keeping you safe. - By quickly killing the fish you will prevent lactic acids building in the flesh during the struggle, improving eating qualities. The fish will also redirect blood supply to vital organs away from flesh. 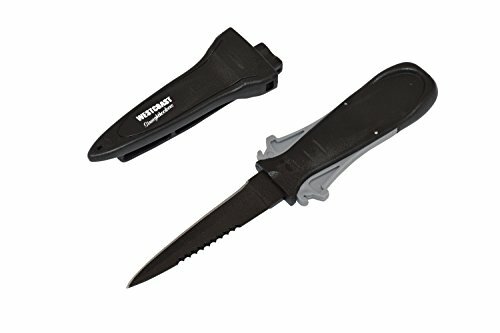 - Bleeding and gutting the fish with this knife immediately after killing will also improve eating quality of your catch. - Rinse the knife in fresh water after use and return to sheath to store. This will prolong the life of your knife, helping prevent corrosion. Simply send us a photo of your damaged or broken product and we will send you out a replacement. 3.5 Inch long, double edged blade, serrated on one side. Knife sheath with clip-in style retaining system. Leg/arm straps included, or fit to your weight belt. Manufacturer: Shanghai Divtop International Trade Co., Ltd. Publisher: Shanghai Divtop International Trade Co., Ltd. Studio: Shanghai Divtop International Trade Co., Ltd. If you have any questions about this product by Westcoast Straighthookers, contact us by completing and submitting the form below. If you are looking for a specif part number, please include it with your message.